I first watched this one in person in the Georgia Dome. I saw it from around the 15-yard line on the Auburn side. It was the opposite view of the TV shot. I hate Auburn games in the Georgia Dome. Especially an opening season game that’s just too big and eventually won’t make a huge bit of difference later in the season. Oh well, by now I know what happened, so this rewatch should be less stressful than that 4th quarter. Yeah, probably not. Verne’s pre-recorded intro really made this game sound important. Cows are falling from the sky. On TV you couldn’t tell that about ten of them got caught on the above-field camera wires and ended up falling on the field throughout the 1st quarter. Petrino is interviewed by a young blonde. She asks who the quarterback will be. Ol’ Bob gives a flirty answer. I can see how he wins ’em over. Oh, the officiating crew was from the Big 10. That explains a lot. Daniel Carson, according to Verne, kicks it deep. That’s Carlson, chubs. So that’s what Petrino was doing. This whole offseason he’s been teasing about the starting quarterback and it was just to run a trick play with two quarterbacks on the first play. Not sure where that awful throw was from the freshman QB the whole 2nd half, though. Verne says his depth chart had Tray Matthews as #39. He was #39 a month ago. DUUUUKKKKEEE should’ve scored, but somehow two Louisville DBs run into each other and it caused the tackle. I was positive they were going to give Peyton Barber the first touchdown. So positive that I had no idea Jeremy Johnson had run the ball in for the first score. 7-0 Auburn, 12:49 1Q. Every time I see the Affliction-font last names on Louisville’s jerseys, I get physically ill. The Louisville speed sweep got the Auburn defense a lot, from the first real play through the end. Then the Auburn defense pretty much showed what the rush was going to be like all day. Carl Lawson tackles the running back with one arm while being blocked. Louisville crossing patterns everywhere. They would’ve scored on their first real drive without an inexplicable false start. After that, the Auburn defensive line smelled blood. Louisville’s kicker was probably recruited by Alabama. Shank. Ricardo Louis is the speed sweep guy this year. Jeremy Johnson makes his first throw into double coverage of the day. It will be fixed. Wow, I didn’t realize how terrible the spot was on Jeremy’s scramble. They took away half a yard, which caused Gus to think twice about going for it. But it was on the Auburn 30 and it was early. The punt was a good choice. I guess. The defense makes up for it with a smothering 3-and-out. That is refreshing. They covered an outside run, a scramble, and a swing pass. Smothered. The first of 50,000 holding calls against Auburn. Kozan’s hand went down the defenders arm, so he obviously pulled him away. And a really, really bad interception by Jeremy. Intercepted by Josh Harvey-Clemons. That’s two interceptions in the game so far. That’s two former UGA defenders that were part of the Miracle at Jordan-Hare intercepting. It will be fixed. 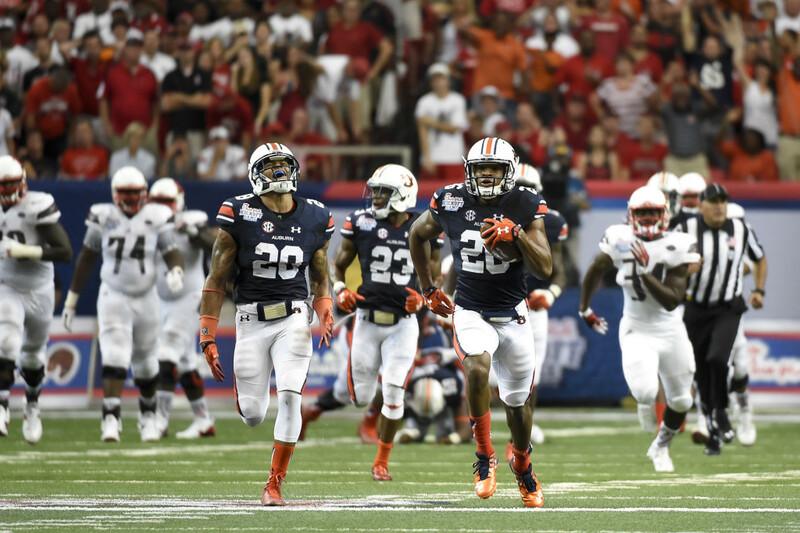 It felt like Auburn dominated the 1st quarter, but that interception in Louisville territory hurt. Louisville converts a 4th down at midfield. What’s with Auburn playing you rogue, offensive minded coaches that’ll just do that because it’s fun? Three guys sack the quarterback. Then Maurice Swain gets through almost untouched for another sack until the lineman pulled him backwards and it wasn’t called. Then three guys sack the quarterback. Punt, Louisville, Punt. I know Carl Lawson is fast, Verne, but he’s no Carl Lewis. It’s Lawson. Lawson. Another holding call on Auburn, and another really, really bad interception by Jeremy. Triple coverage. Intercepted by Josh Harvey-Clemons again. It will be fixed. Another near sack by Auburn (Montravius Adams), another uncalled hold by Louisville. Another near sack by Auburn (Montravius Adams), another OH WAIT, he got to the quarterback before he could even hand it off, and he dove on the ball. NO HE DIDN’T. Justin Garrett picked it up and literally could’ve walked after he passed the 50-yard line. 14-0 Auburn, 6:54 2Q. Louisville switches quarterbacks, and he’s run out of bounds, but there was a timeout before the play? Then he runs the other way on the next play, and he’s run out of bounds. Noticing a theme? How about Michael Irvin’s nephew, the freshman, the starting nickel, Tim Irvin, making a play to force a punt? (That’s three questions in this one Louisville drive). Jovon Robinson makes an appearance with a really nice, hard 10-yard run. Gary Danielson remembering specific pass plays from Cam Newton’s year at Auburn. Jovon Robinson with another nice, hard run. But he has a limp, and that’s the last time he plays in the game. He should be okay, though. Melvin Ray with a bad drop. Jason Smith with a great catch to extend the drive. Auburn has to take a time out, and Gus is screaming “THAT’S MY FAULT, FELLAS, THEY CAN’T STOP US!” But he said it with the meanest face possible. I was scared. The Peyton Barber show is starting. Tre Mason tried to tell us. The third of Auburn’s 50,000 holding calls and it takes Auburn out of field goal range. NO IT DIDN’T. 56-yard field goal by Daniel Carlson. Verne gets it right that time. 17-0 Auburn, 0:34 2Q. Alabama Louisville tries a field goal with one second left on the clock. He kicks it 56 yards. Too bad he needed 61. I predicted it would be 17-17 at the half. 17-0 is better. Sorry Under Armour, but the new armpit stripe sweater vest you have Gus in is hideous. Those aren’t even Auburn stripes. Gus fixing his clipboard while he’s being interviewed at the half. Like a boss. The Peyton Barber show continues. It’s Tre Mason all over again. Gus just sometimes looks at the field and says “Oh God” before the play even starts. I don’t know why. Maybe he’s such a perfectionist that he doesn’t like when someone’s socks are a little twisted? Jeremy with a tad bit of a scramble to the right and chunks it to Ricardo Louis standing one yard in the end-zone. Not double covered. Touchdown. 24-0 Auburn, 11:21 3Q. At this point I almost tweeted that Auburn fans shouldn’t get too settled with a 24-point lead. I’m glad I didn’t. It was almost my fault. I also remember saying that 24-0 to Louisville probably sounds insurmountable, but to me it sounded like just a 24-point lead. Why am I that way? It feels like Louisville has been running up and down the field, but with 7:07 left in the 3rd quarter, they finally put their first points on the board. 24-3 Auburn, 7:07 3Q. I love the Miracle at Jordan-Hare as much as anyone, but Verne has found his one thing he’s going to mention 50 times in the broadcast. Jeremy Johnson with a perfect deep ball to Jason Smith… but Braden Smith called for holding as he fell down. This was the turning point of the half. Had Auburn scored, it would have put them up four touchdowns. Instead, with a 15-yard penalty attached as well, the drive went back 25 yards. After chipping away at a 35 yard deficit, Jeremy throws his third very inexplicable interception on a scramble. Thankfully it’s his last, but it changed the game. It will be fixed. With hope, Louisville let their running quarterback loose and ran backyard football for the rest of the game. That approach works quickly after the turnover. The new quarterback runs it in on a zone read. 24-10 Auburn, 1:21 3Q. CBS using the same newspaper graphic they used to show Cam Newton headlines to now show Petrino/Jetgate headlines. DUUUUKKKKEEEE with a big first down that extended the drive and kept Louisville at bay for a bit. The Peyton Barber show continues with the coveted wheel route, then he gets his 100 yards rushing on the next play, then CBS shows the heart-shaped hole torn in the back of his pants. Have some respect. Ricardo Louis takes the sweep around left end, the refs confer for way too long, and it’s a touchdown. Auburn’s truest scoring drive of the game. 31-10 Auburn, 10:04 4Q. And now we’re to the portion of the game where Auburn’s defensive line is still able to rush the quarterback, but he scrambles like another guy who used to play in the Georgia Dome that ended up fighting dogs. Tray Matthews with a good but very strange tackle that takes him out of the game. After the game he was smiling and just had ice on his shoulder. He should be fine, but that has a lot to do with how the rest of the game goes. More scrambling, an option, a blatant hold that wasn’t called, and a run around right end brings Louisville within two touchdowns. 31-17 Auburn, 6:21 4Q. Jeremy tries to force one between every Louisville defender on the field. Luckily the one that touched it dropped it. He then overthrows Ricardo running down the middle of the field. Punt. Sorry, game of delay, then punt. Louisville is pumped. Plays are working. Not good. Auburn nearly sacks the quarterback 57 times, but each time something positive for Louisville happens. This isn’t real football. I’m calling Louisville’s last drive of the game “Kitchen Sink.” Is this what we want football to be? Just like the last touchdown, the Cardinals run it in on the right side. Auburn leads by just a touchdown. 31-24 Auburn, 2:59 4Q. Onside kick. Not a good one. Tre Williams of Auburn recovers. Wait, a linebacker is on the hands team? Auburn does get nothing on the next play, unless you want to count the 5 yards they received on one of the only flags thrown at Louisville all night. Offsides. YES! Peyton Barber converts the 3rd-down. Game over! … Wait. Another holding call. Louisville calls timeout. It’s 3rd-and-12. There are 52 seconds left. The clock wouldn’t have started after the penalty. There was no run-off. That was dumb. 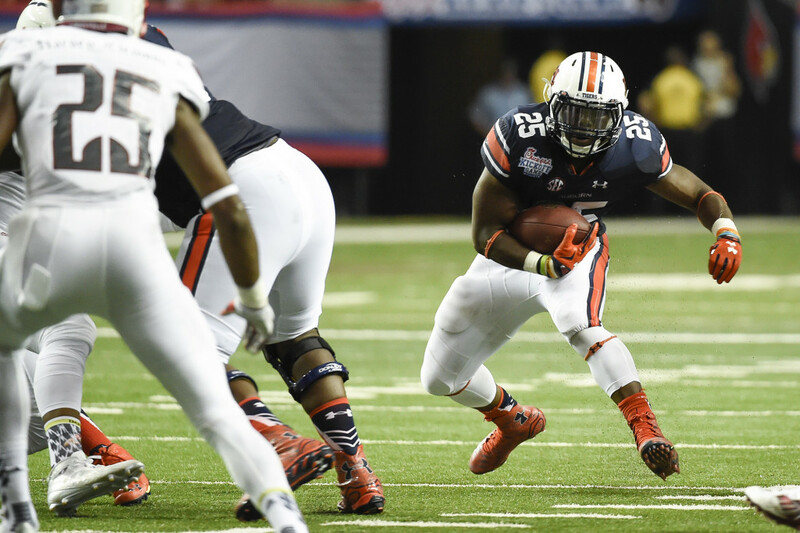 Auburn runs Peyton Barber on 3rd-and-12. He gets two, and Louisville fans cheer. They don’t realize that Auburn is about to run run 40 seconds off the clock. On 4th down, with three seconds left, Jeremy steps back and chunks it in the end zone. Game over. Auburn didn’t dominate the stat sheet. They didn’t dominate the final score. They made some game-changing mistakes. They left Louisville back in it. But they won, and that’s all that matters. 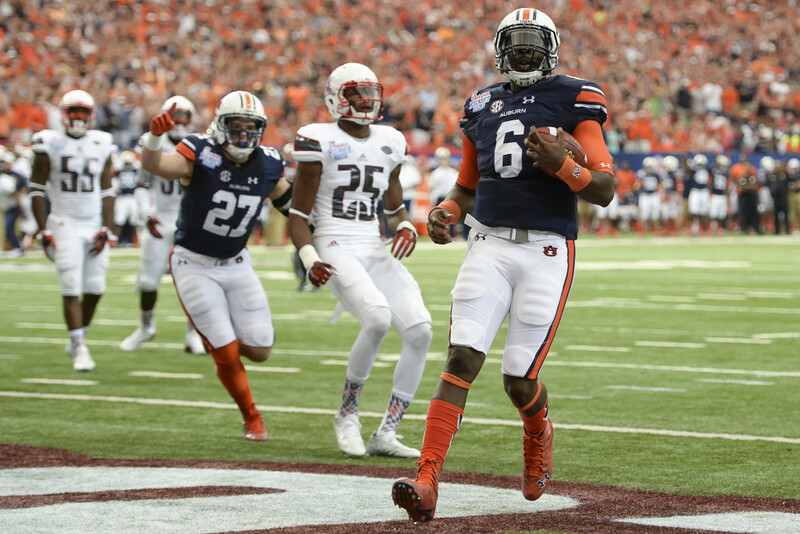 Jeremy Johnson had at least five really, really questionable throws. Three of them were intercepted. That will be fixed. The defense played really, really well until Louisville realized they had nothing to lose and let their freshman quarterback run all over the field. That won’t happen every week. Alabama won’t do it. LSU won’t do it. Georgia won’t do it. That was a team playing with reckless abandon down three touchdowns in the 4th quarter. The injuries to Carl Lawson and Tray Matthews had something to do with that as well. Their injuries are not supposed to be serious. Two other injuries that aren’t expected to be serious are with running backs Roc Thomas and Jovon Robinson, but given what we saw out of Peyton Barber, that may not even be an issue. I’m not worried at all by the performance, and you shouldn’t be either. It was the first game, and in a few weeks it will be seen as a good win, on a big stage, against a good team. Auburn is 1-0, and it was a good one. That’s all that matters. Didn’t realize how great Peyton Barber was in pass protection until watching the replay. Not sure why he didn’t win the starting job. Would like to see a lot more of him this season even with Roc and Jovon back. Great write-up! I was at the Georgia Dome for the game and had a lot of the same feelings as the game went on. When the band cranked up “Living on a Prayer ” midway through the 4th I thought here we go. Having been an Aurn fan for many years thie end of the game was no surprise to me! But in retrospect this will be good for us. We know what needs to be fixed and the coaches will not have any trouble getting the players’ attention. And on a side note didn’t it seem like the band played Glory, Glory to Old Auburn a lot more than the fight song? We were sitting in the section right next to the band so I was pretty cued in to what they were playing! War Eagle- always good to get the W!